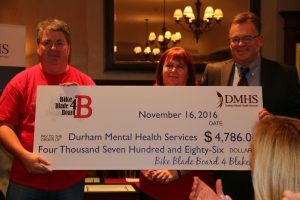 Last year’s inaugural event raised thousands of dollars for DMHS and Bereaved Families of Ontario. This year’s event, happening Saturday, September 9 along Bowmanville’s beautiful waterfront trail invites participants to bike, blade, board, walk or run the trail and then enjoy a BBQ, listen to some guest speakers and also listen for their ticket to be called in one of the many prize draws. For more event details or to obtain a copy of the pledge/registration form, please contact Suzanne or Chris Garvey at csgarvey@rogers.com. Chris has a tattoo with a picture of Blake that says “No Blame, No Shame, Just Love,” a message that perfectly captures the spirit of this event.